Open access lockers are great in numerous settings, including police stations, firehouses and factories. Miners and sporting teams can also benefit from the design of an open access locker. There are different elements of the locker you can decide to include depending on where the lockers will be and who they will need to accommodate.Plastic is a miracle material when it comes to fabricating a secure locker that lasts. Our solid plastic design is heavy-duty and welded along the joints for long wear, even with everyday use and abuse. The smooth surface cleans up easily and resists graffiti. And in areas where moisture might be a problem, such as shower rooms, rust is never an issue. These lockers resist water and keep their good looks without any corrosion or material breakdown. The top and bottom portions of the Open Access Gear Lockers have secure areas where some personal items may be stored without risking theft or damage. At the top, there’s a small locker with small ventilation slats. And at the bottom, there’s a footlocker with additional vents so clothes and shoes can breathe. Both the top and bottom locker compartments can be securely locked, which means team members or employees have a safe place to store valuables and personal items. Additional open cubby storage at the top offers a spot for items where security isn’t as critical.You also get a choice of storage dimensions. All lockers in this line are 72 inches high. But you can choose from a depth of 24, 30 or 36 inches and widths between 18, 21 and 24 inches. That lets you create the perfect locker storage, no matter how large or small the available space happens to be. Open Access Gear Lockers are heavy use storage furnishings for busy locations. That’s why XPB Lockers offers tough, water resistant materials that clean up easily. 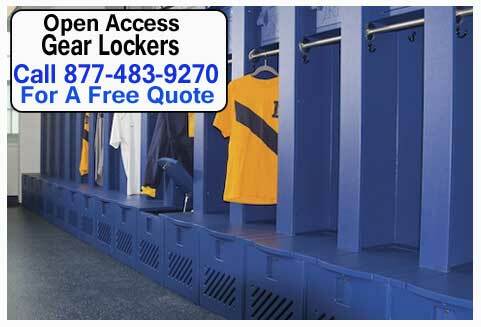 They’re the ideal locker room storage for sports teams, private gyms, emergency responder departments and more. Call us for more information about these and other lockers at 1-877-483-9270. And to compare this style with the other lockers that we offer, check out our online catalog.